In this analysis, Cecilia Ologunagba of the News Agency of Nigeria (NAN) writes that the Federal Government is adopting the Focus Laboratories option to stimulate investors’ interest in power, agriculture and manufacturing to drive its Economic Recovery and Growth Plan (ERGP). 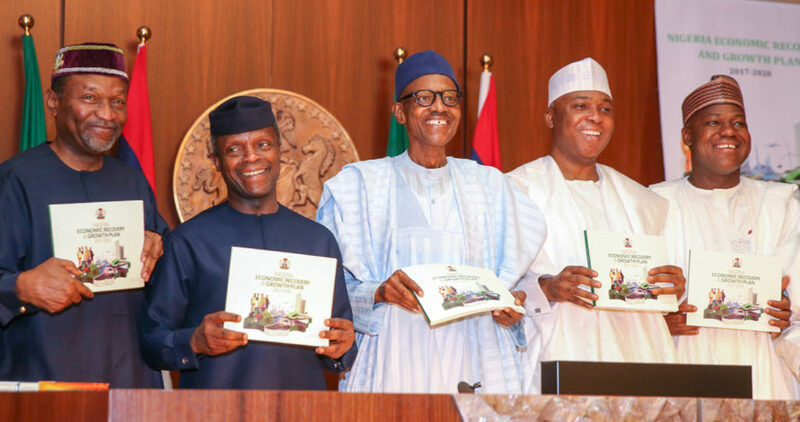 The medium term Economic Recovery and Growth Plan (ERGP) 2017 to 2020, inaugurated by President Muhammadu Buhari to address the country’s economic challenges, will be one year old in April. Integral to the ERGP is an ambitious roadmap to return the economy to the path of growth and achieve seven per cent growth rate by 2020. The driver of the ERGP is the Focus Laboratories on power, agriculture and manufacturing recently inaugurated by the Vice President Yemi Osinbajo. The laboratories have been designed to fast track economic growth. According to Prof. Osinbajo, the Focus Laboratories would further boost economic growth and ensure continuity in Nigeria’s determination to build a competitive economy. The vice president said: “The labs will operate by bringing together all private and public sector officials to achieve the ERGP’s objective of reaching seven per cent economic growth by 2020. “The Focus Labs are being conducted in three selected areas to accelerate investment and job creation. “These specific areas are agriculture and transport, manufacturing and processing and finally power and gas sector.” Osinbajo explained that the laboratory groups were meant to bring private/public sector participants and potential investors together to think through the implementation of the specific areas of focus. “We believe that working together as a group, we will be able to achieve these specific objectives that have been set out for us,” he said. Budget & National Planning Minister Udoma Udo Udoma said the government would improve power generation and its operational capacity to 10 gigawatts by 2020. But two years to the deadline, the Federal Government has only succeeded in generating four gigawatts. The former senator has however expressed optimistic that the laboratories will eliminate the bottlenecks that hinder private sector investment in key sectors of the economy. He listed the sectors critical to economic growth as agriculture, manufacturing and power. The minister said the removal of the bottlenecks has become imperative because $245.1 billion would be required to implement the ERGP, out of which $195.98 billion would be sourced from private sector and $49.15 billion dollars from the public sector. Udoma said the three main objectives of the initiative were to create new investment opportunities for critical projects, job creation and resolution of complex inter-agency problems that inhibited private sector investment. In continuation of the executive/legislative engagement on critical plans and activities of the ministry, Udoma at the National Assembly on February 21 to brief a joint session of its leadership on the economic recovery focus laboratories. The minister explained that they were aimed at driving the critical sectors of the economy to achieve the strategic objectives of the ERGP. The objectives are restoring economic growth, investing in the people and building a globally competitive economy. Udoma said the ministry established the labs because of government’s determination to actualise the strategic objectives of the major enabling sectors of the ERGP. According to him, they would unlock investment potentials stalled due to bureaucratic bottlenecks and in the process, fast track the projects to enable investors to mobilise their investments. The labs therefore, he said, are aimed at fast-tracking the attainment of the set objectives and to deliver quick and fast results to the citizens. He said this would be achieved by identifying actionable projects and removing roadblocks that had been impeding their implementation. Udoma, however, told the legislators that since government alone could not shoulder the provision of critical infrastructure and provide investment capital needed to drive the process, it decided to create an enabling environment. The minister said: “It has decided to not partner with the private sector for investment funds, but also make the environment attractive to investors. “To achieve its goal, the government must target its investment drive significantly at investors with the capacity to boost the economy and create jobs for Nigerians. “That is why it is embarking on the labs to fashion out a strategic direction and then conduct a mass crowd sourcing of ideas to mobilise resources into the focused areas.” The minister said that labs would also identify catalytic Entry Point Projects (EPPs) that would mobilise private investment projects to spearhead investment and job creation in the specific sectors. The labs are being executed in three phases: Pre-lab expected to take place from January 15 to March 4; Main lab, from March 5 to April 15 and Post lab, April 15 to May 13. Deputy Senate President Ike Ekweremadu who represented Senate President Bukola Saraki at the session, commended government’s move at ensuring the implementation of the plan, and that government had become serious about developing the economy. He urged Nigerians to stop de-marketing the country through unnecessary criticism and pessimism, making it difficult to find solutions to problems besetting the economy. He said Nigerians should put their acts together and think patriotically. Ekweremadu suggested that some structures of government should give way and allow funds to be put to proper and more beneficial use to the people. He called on the Federal Government to reinforce its security architecture and power infrastructure to ensure a conducive environment that would attract investors. House of Representatives Speaker Yakubu Dogara commended the executive for ensuring the objectives of the ERGP were realised. Dogara, however, urged the Federal Government to do something about the interest rate regime as Nigerians might be unable to effectively participate in the investment programme because of funding constraints. Dr Idris Jala, the Head of the Malaysian Performance Management Delivery Unit (PEMANDU) briefed the leadership of the National Assembly on the Malaysian experience. According to Jala, the Malaysian economic history has a lot of semblance with the Nigerian experience. He said at a point the Malaysian economy took a downward turn and he had to warn that unless there was a fundamental way of managing the economy, the country would go bankrupt. Dr. Jala recommended transformational leadership at all levels, which entailed taking actions that might be painful in the short-term but beneficial in the long-run to the people.